How does AdGuard protection work? Do I need the ROOT access? How to manually configure a local HTTP proxy? How to use a third-party VPN along with AdGuard? What restrictions does a VPN mode have? When asked to enable VPN, I cannot tick the "I trust" checkbox. Why? Why do I get a "VPN is not supported" dialog message? Why do Android stats show that AdGuard consumed more traffic than it saved? Why Wi-Fi and USB tethering do not work with AdGuard? Which browsers are not supported by AdGuard? Why a VPN can not be started on Android 5.0? How to resolve known compatibility issues with other apps? Why is the firewall's function partial and the data stats not that accurate in proxy mode? Then, the proxy mode is bad? Why are some apps excluded? How does DNS filtering work? How does HTTPS filtering work? All right, how can I enable it? How to remove a certificate from the system? What is the difference between AdGuard filtering methods? How to manage AdGuard notifications? AdGuard is a remarkable internet filter that protects you from annoying advertising, malicious and phishing websites, online tracking and much more. AdGuard handles all types of Internet ads, speeds up page loading, saves bandwidth and increases your device protection against possible threats. AdGuard filters your browser traffic by blocking requests to phishing and malicious websites and removing intrusive browser advertising. AdGuard can use two modes of traffic filtering. If you are using this mode, AdGuard does not need ROOT privileges to carry out filtering. At the same time, a VPN-server is located on your device, so that there is no need to pass your traffic through a remote server in order to filter it. In this mode AdGuard launches a local HTTP proxy server on your device. This mode is recommended, if you use a rooted device. Otherwise, manual adjustment of an HTTP proxy will be needed to use this mode, the filtering in mobile networks (Edge/3G/4G) will also be impossible. Unlike most applications that are engaged in traffic filtering, AdGuard does not require ROOT access to your device. In local VPN server mode AdGuard, will filter all your traffic and ROOT access is not needed. In the AdGuard Settings select Local HTTP Proxy mode and Proxy setup mode — Manual. Go to your phone settings and choose Wi-Fi. A list of wireless networks will be opened. If the device is not yet connected, connect to the Wi-Fi network that you need. Open the network setting by pressing the line with this network. The following menu of the selected Wi-Fi network will appear. Select Modify network. In the new window select Show advanced options. Enter 127.0.0.1 in Proxy hostname and enter the port that is showed in proxy settings in AdGuard application itself (port 8080 is used in AdGuard setting by default). A proxy server has been set up. Now all Wi-Fi traffic will be filtered by AdGuard. If you are already using a VPN for other purposes, then in order for AdGuard filtering to work, you can change it to the HTTP proxy server mode. The filtering mode can be changed in the Advanced Settings. In this mode, there are two ways to set up a proxy: automatic and manual. In the automatic mode, enabling of filtering does not require any action from you. Filtering will work in both mobile and Wi-Fi networks. The problem is that the automatic mode can be operated only on rooted devices. This approach may not work in some situations. It depends on your firmware and the actual VPN app. In some cases traffic bypasses a manually configured proxy. In the manual mode, filtering will only work in Wi-Fi networks. You will have to manually configure the use of a proxy server for each Wi-Fi network. AdGuard filters traffic using a local VPN-server by default. In this mode there are some restrictions. In a local VPN mode AdGuard won't be run automatically after turning on the phone, because this capability is blocked by the Android OS. Cannot be used along with other VPN applications. If you are using an application that enhances your display (for example, Night Mode or Twilight), you need to temporarily disable that application. Android prevents your selection for security reasons. This dialog appears when AdGuard fails to create a VPN connection on the device. So far, we've identified the following situations where this can happen. You're using custom firmware that is missing a tun.ko kernel module needed for proper VPN support on Android. The firmware on the device has not been configured correctly. If the manufacturer is aware of the problem, the issue may fixed in future firmware updates. If you have ROOT access you can restore the VPN module (tun.ko) using a special app tun.ko installer. You can switch to the Local HTTP Proxy filtering mode in AdGuard's extended settings. On Android's Data usage page or in your favorite data-traffic tracking app, you might see an indication that AdGuard has consumed all or most of your mobile traffic. Make no mistake - it's your apps and not AdGuard that consumed the data in question. There is a known issue with Android when VPN or a proxy is established, with all traffic from all apps being assigned to AdGuard. We hope that this clarifies what's happening. Android does not allow tethered connections to route through the VPN. This is an Android rule that applies to all VPN apps running on non-rooted devices. This is done for security, out of concern that if a malicious individual was able to get access to your tether, they could piggyback onto the VPN connection. Disable AdGuard when you want to use tethering. If you have ROOT access, you may switch to the proxy filtering mode instead of using VPN. It may be done in AdGuard's extended settings. In general, AdGuard does not support browsers with traffic compression option. The only browser supported is Google Chrome. We can filter its traffic even if traffic compression is on. AdGuard can filter the Opera browser, if you don't use the Off-Road mode. Otherwise the traffic is compressed, so we cannot filter it. The Opera Mini browser always compresses the traffic so AdGuard cannot filter it. AdGuard can filter the UC Browser, if Speed Mode or Cloud Acceleration is disabled. Otherwise some of the traffic is compressed and encrypted so we cannot filter it. The Puffin browser always compresses the traffic so AdGuard cannot filter it. There are two known bugs of Android 5.0 which may break a VPN start-up. The only solution is to reboot your device. This section names third-party apps which are known to be incompatible to some degree with AdGuard. In some cases, either AdGuard or the conflicting app can be configured in some way to resolve the incompatibility. Problem: Orbot: Proxy with Tor is a VPN app and you cannot have two active VPNs at the same time. Solution: setup AdGuard to use Orbot as an outbound proxy. Proxy type SOCKS4, host: 127.0.0.1, port: 9050. Problem: Opera Max is a VPN app and you cannot have two active VPNs at the same time. Solution: (ROOT is required) switch filtering mode to Local HTTP proxy in advanced settings. There are many types of data-traffic on the Internet: the Web, VoIP, Games, VPNs, UDP traffic (including DNS-requests) and so on. In the VPN mode, we control every packet of data that is coming from any app, but in the proxy mode we control only a subset of the traffic. Therefore, we can not guarantee full connection disabling for particular apps and the numbers that you see in AdGuards statistics in proxy mode may be inaccurate. Not at all. If you don't care so much about the statistics and the UDP traffic you can use it without hesitation. There are some cases in which some applications need very unconventional ways to communicate through the Internet, or the filtering procedure is breaking some app functionality. Therefore, some applications have to be excluded from filtering. We hope such measures are temporary as we are constantly improving our filtering and network algorithms. AdGuard can filter domain resolution requests to the Domain Name System servers, handle them locally, and block requests to phishing, malicious, advertising and tracking systems on such domains. Blocking is implemented by sending back a specially crafted response that redirects all traffic to local network interface (with 127.0.0.1 IP address). Then the browser or app that intended to connect to such a domain will try to connect to a server on this particular device, and eventually get an error. Q: If this seems like a best way to filter ads, why use something else? A: Because there are many advertising systems that use the same domains for advertising and also some useful services. The DNS filtering can be used just to speed up overall filtering process and to save some battery juice. Q: Why can't I use DNS-filtering with a Local HTTP proxy mode? A: Because we need to filter all traffic (all network packets) sent from your device for DNS-filtering. Only VPN mode can accomplish such a thing. HTTPS is similar to HTTP (Hyper Text Transfer Protocol), but using an encryption protocol (called SSL/TLS), as indicated by the last letter S (Secure). This protocol is used for the transmission of sensitive information, such as MasterCard/Visa card numbers and personal data. Why should it be filtered? Now more and more websites, blogs, and social networks are switching to HTTPS. Then, following blogs and websites, more and more ad networks are switching to HTTPS as well, because it is necessary to display ads on the sites working over HTTPS. The following are examples of popular websites, where ads cannot be removed without HTTPS filtering: youtube.com, facebook.com and twitter.com. If this was easy, HTTPS wouldn't be secure. In order to filter secure traffic, AdGuard will create two secure connections. One to a browser, or other application; and another to a server. It is important that in this case the browser "trusts" AdGuard and its created connection. For this purpose AdGuard generates and installs a special root certificate in the system and, if necessary, in certain browsers e.g. Firefox. Of course! Your connection to the remote server stays encrypted and secure. Just like a browser AdGuard checks the server certificate before starting to filter it. By default, AdGuard doesn't filter websites of financial services and websites with important personal data. Filter ONLY connections to domains on the blacklist. Filter ALL connections EXCEPT those to domains on the whitelist. We have pre-added domains of financial institutions and banks there, and this list will be updated in the future. Install certificate into the system certificates storage. If you do not have a password or lock screen pattern, then Android will require one of the options to be set up. This is an Android requirement. Restart the protection. If you have done everything correctly, the HTTPS filtering will work like the usual filtering. Go to Android settings -> Security -> Trusted credentials. Go to the "User" section. Select "AdGuard Personal CA" (it might be the only certificate there). In the opened dialog window scroll down and tap 'Remove'. High-quality method is able to use all sorts of filtering rules and can filter everything. This method allows to change the HTML-code of a page cutting out all unwanted elements before the browser even loads the page. High-quality method can increase the pages loading time, so it is recommended to use only on powerful devices. High-speed method is able to use all rules save for HTML filtering rules and filters everything except page content. This method uses so called cosmetic filtering rules which are used not for blocking ad requests, but for changing the page appearance. Cosmetic rules include adding some special CSS-rules (styles) which hide the unwanted advertisements on a page and mask the removed elements' remains after blocking, such as empty fields in the place of the blocked banner, etc. Simplified filtering method is able to use just the basic filtering rules and lets block only ad requests. In contrast to the High-quality and High-speed filtering methods, the Simplified one does not use cosmetic filtering rules. On Android version 8 and newer AdGuard provides multiple notification channels (which are also called 'categories'). With their help you can easily manage AdGuard notifications on your device — customize channels, prioritize them, disable secondary notifications, etc. Get more instructions on how to do that and learn about options we provide for the older Android versions below. 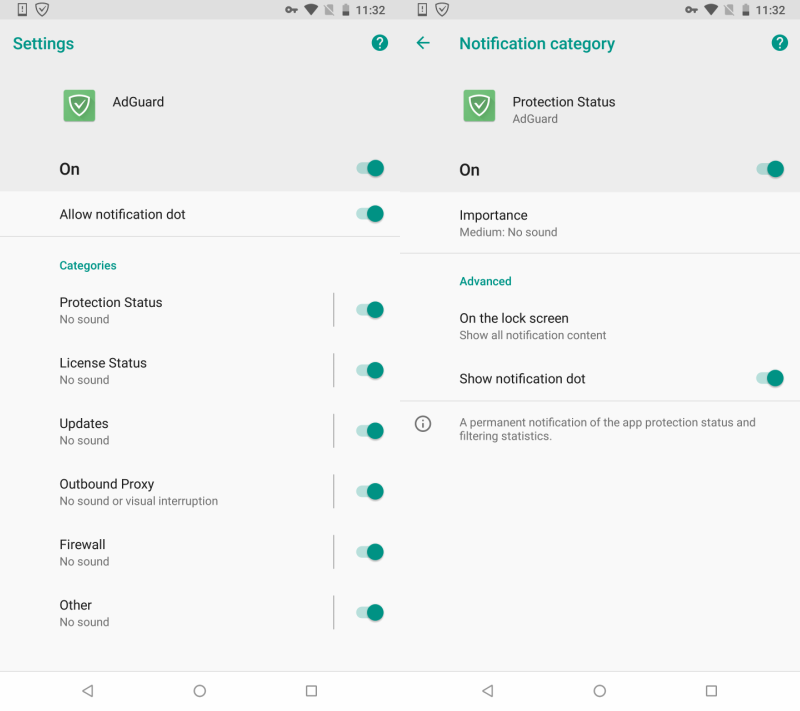 AdGuard for Android 8 and newer has 6 different notification categories. Before describing them, let’s see the way you can find the appropriate settings on your device — Settings → Apps & notifications → AdGuard → App Notifications. Apart from this way, you can get a quick and simple access to these settings when long clicking on any AdGuard notification and choosing "All categories". Alright, you're in the right section. Now you can see 6 different categories, which are shown on the left part of the following screenshot. Other (notifications about critical errors, logging, conflicts with other apps etc.). They are all enabled by default. You can customize the settings of each category (look at the right part of the above screenshot) — change its Importance status, set any supported sound of notifications, choose whether notifications should vibrate your phone or not, etc. In case you decide that some notifications are absolutely not important for you, you can disable the respective category(ies). As mentioned, you can also choose the Importance status which will let you give every notification category the priority needed. Please look at the screenshot. 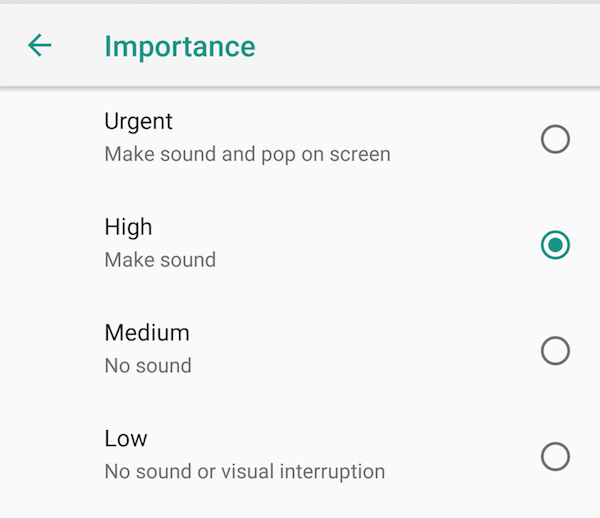 Please note, that starting from Android 9 "Importance" renamed to "Behaviour"
Low (notifications will make no sound and give no visual interruption). Please note: you can't enable the vibration for those notifications whose Important status is determined as Medium or Low. We do hope these notification categories will help you sort through all the AdGuard notifications and let you enjoy using our product without unnecessary distractions. For those who have devices on Android 7 and older AdGuard has also some useful options for managing notifications. Or you can disable all AdGuard notifications (what we would not recommend you to do) by choosing "Block all" option. Besides, you can manage the notification of protection status in AdGuard General Settings (AdGuard → Settings → General → Notification icon). Please note: if the icon is removed, Android can stop AdGuard functioning any time. That's why we do not recommend you to choose "None" option. Please use "Notification without icon" instead.